The South Bay Clean Water/No Border Sewage Movement posted notification on social media yesterday from the International Boundary and Water Commission (IBWC) stating that during installation of new electrical equipment at the pump station on the Mexico side of the border (CILA), the pump station was partially shut down resulting in “approximately 300,000 gallons of Tijuana River water” flowing into the United States. Ginger Sacco, who monitors the IBWC river gauge for Citizens Against Sewage (CAS), noted the flow earlier in the day when she said, “No rain today, but we have had 301,752 gallons pass through the river gauge.” She contacted the Area Operations Manager, Carlos Pena, at the time of the flow to understand the cause, but had not heard back as of this morning. This flow is important from both ecological and procedural standpoints. 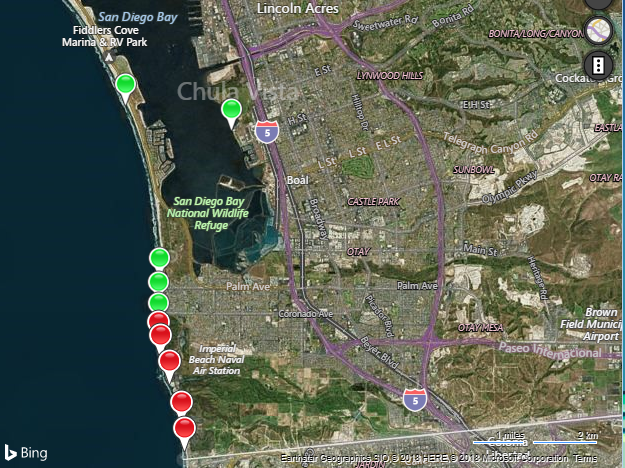 First, the notification indicates that “Tijuana River water” flowed into the U.S. This makes it sound like regular river water. However, the Tijuana River is an intermittent river, flowing naturally only when it rains. Anything that went into the river in the absence of rain cannot be counted on to be clean (it is wastewater). Additionally, the river valley itself is so polluted with toxic chemicals, sewage and discarded garbage that even if potable water flowed through it, it would not be potable by the time it reached its resting place (whether in the ocean or somewhere short of that). Moreover, the Pump Station CILA appears to have been shut down without prior notification to the United States IBWC. Should there have been planned work on the Mexican side, the U.S. side should have been notified. Instead, it appears that the US side was notified by CAS. sdbeachinfo.com beach closure as of 9:30am, February 21, 2018. Screenshot of website. 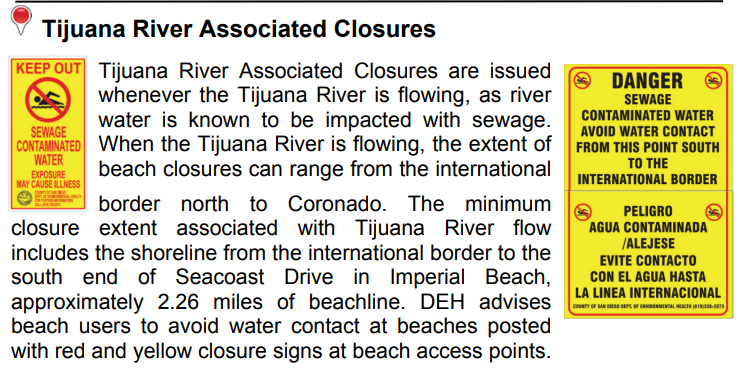 Meanwhile, according to SDbeachinfo.com, beaches remain closed in Imperial Beach along the Tijuana Slough shoreline.